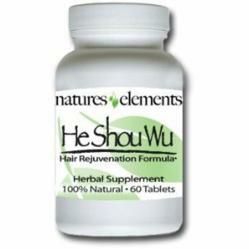 Natures Elements, a vitamin and herbal supplement retailer, releases He Shou Wu. He Shou Wu has helped thousands of customers stimulate hair growth and reverse gray hair. My hair is growing like wild fire! My friends were so impressed with the results that they started trying it. He Shou Wu, commonly referred to as Shou Wu or Fo-Ti is known for its ability to improve hair growth and fullness as well as reverse gray hair. He Shou Wu has been used for centuries by the Chinese as an anti-aging supplement. It began with the legend of Mr. He who's name translates to the man with black hair. After using the root of the Fo-Ti plant Mr. He restored all his hair back to its original black color and experienced more youthful and more energetic sense of well being. These benefits are mainly due to He Shou Wu nourishing the liver and kidneys. This provides a better blood flow to the scalp which in turn stimulates hair growth and helps reverse gray hair. He Shou Wu works to naturally balance hormones and may enhance libido in both men and women. He Shou Wu has the ability to help lower cholesterol and blood pressure as well due in part to its Lecithin Content. All of these benefits make He Shou Wu a tonic worthy of taking for the rest of one’s life. Keep in mind that it is important to determine the extract of the Fo-Ti because various strengths and potencies are available. Natures Elements offers the most concentrated and powerful form of He Shou Wu as a 12:1 extract. Each dosage provides 1,000 mg of 12:1 extract in only 2 tablets. This concentrated dosage of He Shou Wu can provide faster growing, thicker hair and prevent or reverse gray hair. For those who are concerned with hair growth and gray hair but also want improved skin and nails, Natures Elements has Advanced Shou Wu. This product combines the Chinese herb Fo-Ti with other known hair, skin and nail strengthening ingredients such as Biotin and other B Vitamins. Natures Elements is among the few companies around providing customers with an Auto-Ship feature. This is a convenient way for customers to get all benefits the company has to offer. Auto-Ship customers receive 20% off all their orders. Natures Elements is committed to delivering high quality vitamin and herbal supplements and providing real results through dedicated research and superior formulations.